Thanks to everyone who joined us for an Author’s Evening with Eva Stachniak at the Kosciuszko Foundation on Sept. 12, 2017. September 4, 2017 – This week, our time machine travels back to early 20th Century Eastern Europe, where we’ll meet ballerina Bronislava Nijinsky. Bronia was a remarkable dancer and woman, who charted a course for greatness despite the upheavals outside and inside her family. 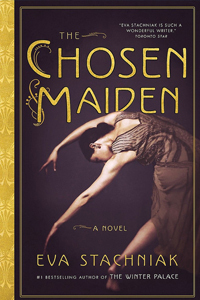 The Chosen Maiden blends fiction and fact seamlessly, while including cameos by giants of the period such as prima ballerina Anna Pavlova, Coco Chanel, and Pablo Picasso. Bronislava Nijinsky was born in the last decade of the Victorian Era, and the inspiration for her brother Valaslav’s play which gives the novel its title: The Chosen Maiden . Our guide on this journey of historical fiction is Eva Stachniak. The Nijinskys inspired her with their lives as Polish dancers in a Tsarist Russia, that gave way to war and revolution. Born in a Poland still behind the Iron Curtain, Eva emigrated to Canada in 1981, and is the bestselling author of The Winter Palace , Empress of the Night , Necessary Lies , and Garden of Venus . Visit her online at EvaStachniak.com, @EvaStachniak on Twitter, or Facebook.com/EvaStachniakAuthor.